How do you Know if your digital marketing efforts are paying off? This quick look at Google Analytics will help you understand how to measure performance. Google Analytics continues to be one of the best tools for measuring your digital marketing performance. Let’s go over the basics of the platform so you can find the most practical information to help you improve your marketing results. Installing Google Analytics on your website is as simple as signing into Google with an existing account, or creating a google account, and going through the step-by-step initiation process. Once completed, you will receive a snippet of html code to paste into your site. Most template-based site-builders offer preset fields for you to paste in the code. The code should be added to each page you want to track. If you are not using a template-based site builder, you will need to paste the code into the html manually. The best spot is near the top of the page. What questions do analytics answer? Where do my site visitors live? Which pages on my site are most popular? Which websites referred traffic to my site? Where did the visitors who took action on my site (like made a purchase or filled out a form) come to the site from? To spot trends over time - Did your website traffic spike during a certain day and can you attribute that spike to something you did, like a particular Facebook post or an email newsletter? Spikes and valleys over time can inform you which of your digital marketing actions are having a positive effect on your website traffic, allowing you to focus on what’s working and tweak or discontinue efforts that haven’t worked. They also show you where the seasonal ebbs and flows are that are affecting your business. To identify your top traffic sources - Knowing how people are finding your website is a key to comparing the success of different digital ads, social media posts (at least the ones that provide a link to your site), and email marketing campaigns. Use this information to evaluate your efforts in these areas. To track where your conversions are coming from - Google allows you to identify particular actions on your site, like when people fill out a form or make a purchase, so you can retrace the steps of those visitors who take those actions. Where did they come from and what pages did they visit on your site? This can help you determine your ROI on particular campaigns by identifying how many people eventually became customers from a campaign. It’s important to note that when you are looking at your organic search terms report, you are not seeing 100% of the data. Many results may be listed as “not provided.” This is the result of a change Google made back in 2011 in the way it harvests its data. It can be frustrating to see “not provided” when you are hoping to uncover the search terms visitors used to find your site. Some of the information is there, but not the whole picture. 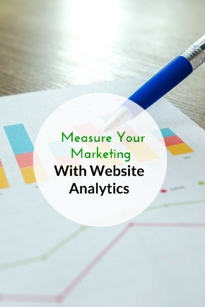 There are ways to work around this and get more information if you are looking to dig deeper and get a more website analytics. This blog post offers a practical guide (with step by step instructions) on how to get more information out of Google and find more of what you are looking for. The data your website produces is valuable information. When you familiarize yourself with the reports in Google Analytics, you can put this information to great use.